This pub, busy with student types (who must be properous!) will provide you with very good beer that is very well kept and presented. It is, however, expensive @ �3.80 per pint. Unfortunately the choice of three real ales disappointed me because all were high ABV - not what you want for an after work pint, I suggest. The landlord should try to get a better range. PS - awful seating. New furniture required. 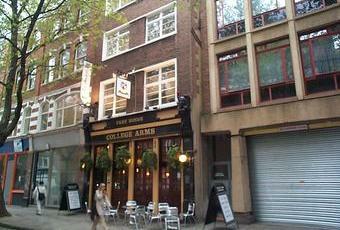 I booked the downstairs bar at the College Arms for my birthday recently, pretty much solely based on the claim that they had a pool table. We arrived to find that there was no pool table, which was vastly disappointing. We were also told by the bar manager at the time of booking that we could stay til 11:30pm, but the bar staff began shooing us out of the downstairs room shortly after 10pm, despite there not being sufficient seating for our party upstairs, and then wanted us out of the pub entirely by 11pm! As for what was being served, prices were a little on the high side and choice was poor. The cocktails were somewhat lacking, despite the �6.50 price tag, and the food, while very tasty, was at the high end of what you'd expect from a basic gastro pub, at �10 for most mains, and ~�5 per starter/side. The decor is attractive and pleasant, but the music is terrible many of the chairs are deeply uncomfortable, the ladies toilets are up a very steep flight of stairs, the outdoor seating is very limited, and the barstaff seemed bored and dismissive. Needless to say, it was a disappointing outcome for my birthday, and I would not recommend this place over any of the multitude of other pubs with similar prices and decor that would actually welcome our good business and honour their promises. Good ales and food, but very expensive. Nearly �4 a pint. 3 for �11 tapas is probably the best value food. The downstairs area is nice and cozy and often not too busy. The music is too loud however. Re-opened last month after a big refurb. Perfectly pleasant to look at and nicely decorated, but prices all shot up ... the food menu has been altered ie smaller tapas style ideas and higher prices. Usually empty lunchtimes during the week. Awful place, met some friends in here and decide to have a bite to eat, bloody hell what a mistaka to maka. Their famous pies were burnt inside and hard as rocks outside, staff couldnt care less even though we were the only people in the pub, ah well dumps like this make you appreciate the better pubs out there.